It's hard to believe that Yes has been around 30 years.....Of course Seth K. (nicknamed The Nose), Mike L (Levs) and I were expecting these guys to come out in wheel chairs and "mail-in" the show. Lev's and I sat outside looking for The Nose in the parking lot and trying to sell an extra ticket. Greg's boy, Vic could not make the show. I was looking forward to meeting the legendary "Vic", but alas no.... We got 10 dollars for a 34 dollar ticket. The Alan Parsons project played to about three people in the stands. As it turns out, Seth was one of them....We heard "Eye in the Sky" and "Where do we go from here?" as they were tearing our ticket at the gate. 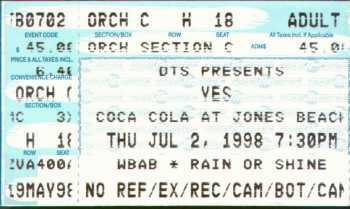 I told Lev's we've come along way, seeing Yes while sipping diet cokes throughout the show versus "getting wasted" in the 70's...... There were quite a few empty seats at the start of the show. The arena was probably about 80% full or 7,000 Yes fans between the ages of 35-54. Some fans dusted off their old Yes T-Shirts. Some guy was walking around with a 1984 Yes T-Shirt that had more holes in it than fabric. Amazingly, the band did not disappoint... We got a great taste of "Studio Yes", masterfully done !! Opened: " Siberian Khatru" - This "Close to the Edge" classic went off OK, served as a warm-up and woke the band out of their slumber. Steve Howe's pedal steel guitar was the highlight. Howe plays better than he looks. He looks like he only weighs about 150...very thin. "Rhythm of Love" - Newer song, energy level rising. "Yours is No Disgrace": This classic from "The Yes Album" perked the venue up. A great version a la "Yessongs" with the lengthy Steve Howe guitar wail in the middle of the song. One of Mike Levatino's favorites. "Open Your Eyes" - Another new one, performed well. "Heart of the Sunrise" - Awesome performance off the "Fragile Album" Classic Chris Squire on Bass, masterfully done. Alan White gives a solid effort on drums, despite the fact that it was one of Bill Bruford's best pieces. "And You and I" The middle classic piece from "Close to the Edge" One of my highlights of the evening. Anderson's voice still sounds strong and youthful. I predicted the Squire Harmonica during the "Sad Preacher verse"... Lev's said "Good Call"
"Wondrous Stories" - Nice little quickie off "Going for the One"......Igor on the keyboards, (who looks like Rick Wakeman) did a nice job all night. Seth was hoping for "Parallels" at this point. Igor knows his place in the band....As Jon Anderson put it "Igor is a big fan of Yes" No ownership here. "CLOSE TO THE EDGE" - Undoubtedly the tent-pole, high water mark of the evening. This 22 minute classic was awesome, studio like quality.....During "I get up, I get down" it looked like the gates of heaven on-stage. The conclusion was awesome, with "Squire" totally animated on bass. Squire was "Warming up in the bullpen" because it led into his classic "The Fish" - Squire proves once again why he is the "Michael Jordan" of the bass guitar. No one else in the history of rock has done more to put the bass on the map. Squire's version of the Fish was awesome, but stopped short of the conclusion of the song...They did not sing "Schandahaleriapramturus" at the end. Perhaps they did not sing it because they still don't know what it means. Apparantly they call Chris Squire "The Fish" because he like to take baths. The day was hot, the band was...lukewarm with occasional flashes of fire. Who to blame? Because of course blame must be apportioned. I sat in the middle level bleachers, somewhat to the right of center (facing Sherwood). From this vantage point, the large projction screens should have been a boon. However, the cameraman had either no clue as to who was playing what onstage, or was simply in a perverse mood, since B. Sherwood seemed to get by far the largest share of video-time. Couple that with a sound mix that flattered the bass far too much, and we have a recipe for frustration. Yes *could* perhaps have overcome these deficits, but the show was largely a wan affair in this longtime concertgoer's humble O, disproving my theory that Yes really kicks out the jambs when playing places like NYC. Steve Howe, in particular, seemed to be having an inconsistent night. His body language and facial mien were of someone who wished to be anywhere but onstage with these silly blokes, playing for these bloated Long Island cows; his playing, which in shows recently past has shone even on the Yeswest material, was adequate but not inspired except on the two extended 'centerpieces' -- Yours Is No Disgrace, and America. He did some really lovely improvising on the latter. My opinion was corroborated by my friend Robert, a prog fan of even greater vintage than me, albeit more a King Crimson man, and someone who thought "America" a bit silly before seeing this performance. However, the poor mix makes accurate appraisal of much-anticipated songs like 'Close to tthe Edge' difficult, since Howe's guitar was occasionally inaudible. Still, I couldn't help getting the impression, from the look on his face when the cameras caught him, that Howe was thinking Caligula-like thoughts of the audience -- 'If you all had one neck I'd hack it through.' Or maybe that was me? Ivan Khoroshev turned in a more consistantly lively performance, in comparison. His playing was pretty much spot-on, but his choice of 'moog' sounds during parts of And You And I failed to convince -- too toppy by half. His rendition of 'Close to the Edge''s climactic organ/moog solo was more authoritative, though he did prominently flub a note on the moog part (what is it that makes this seeminly simple bit such a minefield for every Yes keyboardist that's played it?) He also tore through the "hammond" solo that comes after with great flair. Oddly, the gentle organ chords that go plop-plop behind the verses of 'I get Up I get Down' were parctically inaudible from my seat. The rhythm section was not notably 'on' or 'off' tonight, though Squire's antics during 'HotS' and 'Fish' have become unbearable enough that I used the latter as my 'comfort break'. More power to him for being able to leap around like a bunny during 'Fish' at his age, but it'd be so much more satisfying if there was some musical content to what he was playing. His 'HotS' solo was mediocre and directionless. Anderson was in very good form -- looking thinner and more the gent too, with his new beard. Another anomaly of the mix was that he was often *undermixed* in the multi-vocal sections. And Howe was *too high* in the mix. Anyone who has heard this in concerts past (e.g. Boston Dec 11 74) knows the potential for train-wreck hilarity that this could have entailed. However, Howe (who says he's been taking singing lessons) really does seem to have greatly improved his sense of pitch, leaving only his vocal timbre as a potential 'sore thumb'. Billy Sherwood handled some of Squire's hardest vox (e.g. the high line in 'Long Distance Runaround') with facility, though Squire did plenty of singing in other songs. His other musical contributions were, as before, speculative from where I sat; certainly from the projected evidence, the guy is constantly playing *something*. The big screen real time "Music Video" made viewing concert very enjoyable from less than optimal seats. Hearing CTTE complete was a welcomed suprise! Show opening, CTTE and Yes Album songs were played ala Yessongs.